If you are not able to use the Blogger Template Designer to change your colors and fonts in Tabs (due to customization of the template), then here is an semi-easy way to change the colors and fonts of your "NAVI TABS". (This was written in January 2015, and may not work if Blogger has changed things). 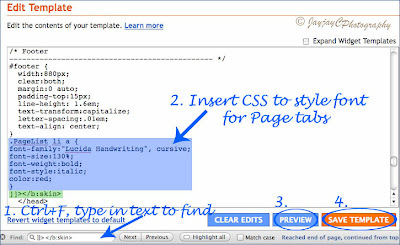 For this, you'll need to edit your blog's HTML - go to Dashboard | Design (previously Layout) | Edit HTML. Before editing, it's advisable to always backup your template completely, by clicking Download Full Template. Finally, click Preview to see your changes. If satisfied, hit Save Template and you're done! Hi Patricia, did you know that I couldn't reply to your comment via email (you are a no reply commenter). Anywho! 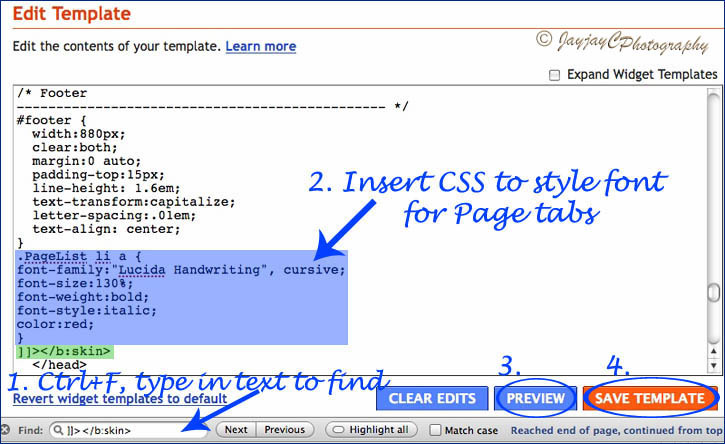 Do you have a customized template? What is your blog address? The font size in question is located right below my photo on the sidebar. I hope by the time that you see my reply, I have already fixed my no-reply situation. Thank you so much for taking the time to help me. Have a great day ahead! Hello! No problem at all. I checked out your blog and it is really adorable! I love your writing style too. In regard to your font size under your photo where it says "About the Self-taughtFreestyler", what I would do to make it easier is to create an image and then place it in the sidebar with the link to the about page. That way you can control exactly what you want it to do. That is what we did here at The Blog Guidebook....most of our titles (above the fold) are created in Photoshop or another design program like PicMonkey and then added as in image. Hope this helps. I will still be looking for an answer to your problem too!